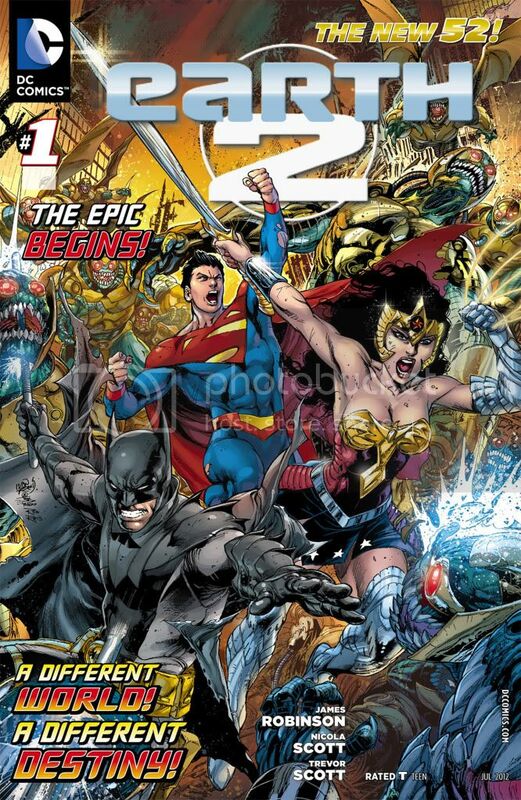 This month has seen the release of the second wave of New 52 titles. Among said titles are two books that finally answer my most pressing question, “Where the balls is Power Girl!?!? !” And while this book does not feature Kara in her Power Girl persona, it does introduce the character. But more on that in my review of World’s Finest Issue 001. The plot of this issue centers around an ongoing war against Darkseid’s forces that has devastated the world. It is almost suggested that this is the aftermath of an invasion similar to the one in the first six issues of The Justice League. Batman, Superman, and Wonder Woman have a plan to take down the towers controlling the Para Demons, but it ends up costing all three of them their lives. Batman is able to take down the towers, and in the aftermath Helena (Robin) and Kara (Supergirl) end up going down a boom tube that takes them to places unknown (unless, of course, you read World’s Finest). The rest of the issue focuses on the beginning of Jay Garrick’s origin story. While my first worry is that the rest of this book will be an unfocused mess, since it seems like it will be focused on Jay Garrick next, but it’s not his name on the book, so I can only assume that the rest of the series will feature other Earth 2 heroes. So I have absolutely no idea where this story is going, but I don’t really care, because this first issue stands well enough alone as its own story. Much akin to the otherworld titles, Earth 2 is a great, condensed, story about the three greatest heroes in the world performing the ultimate sacrifice for the world. It’s a good, “what if?” story, but since two of its main plots were either finished, or migrated to another book. Because of the inability to predict what will happen next, I can’t say whether I’ll enjoy the rest of the series or not. Killing off the three main heroes is a bold move, and I can’t help but hope that the rest of the series will have equally hard hitting stories to tell. But I don’t know if I’d be able to shake the feeling that whatever happens doesn’t really matter, since it’s not the “real world”. In the end, while I’ll save judgement on the rest of the series for future issues, I feel like I’ve gotten what I came for. I’ve seen the origin for New 52 Power Girl and Huntress, and I saw the big three sacrifice themselves, without sacrificing future stories with these characters. Next Post:Anime Reviews: Medaka Box Episode 02 – Are you the culprit? / But of course, it’s me!